The second year of a baby’s life is magical but, to be completely honest, a little insane. They seem to go from wriggling, giggling little beans to actual tiny humans babbling and bumbling around, at a surprisingly fast pace. So to coincide with this all-important developmental stage, it makes sense that the best gifts for one year olds are ones that’ll stimulate them, and ease the transition into full-on walking and talking. You don’t want to go all out with an all-singing, all-dancing, borderline-bankrupting toy if they’re not at the right developmental stage to appreciate it, which is why all of our gifts have been hand-picked to be suitable for a year plus. But it isn’t all about cultivating a future Nobel Prize winner, of course - they’re not shy about giving feedback at this age, and anything that doesn’t hold their attention is sure to be met with indignant burbles and a lot of shouting. These gifts are all highly rated by parents, grandparents and gifters of all kinds for the delight they inspire in curious tots, teaching colours, numbers, motor skills and more through play. Between shoe-related tantrums and goodness only knows what else, getting determined kiddiwinks into the great outdoors can sometimes present a bit of a challenge, but an awesome outdoor toy can help to sweeten the deal. 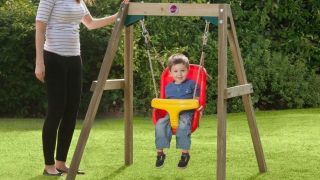 If you’re looking to get out in the fresh air with your little one this year, they don’t come much more awesome than specially sized swing or playset. Gifting needn’t be high-cost or high-maintenance though - they can learn and play in all weathers with our selection of indoor toys, from rockers to walkers and ride-on buses to teriffic train sets. With an innovative design marrying the fun of a ride-on toy with the independence-boosting thrill of a walker, this red London bus toy is sure to be an instant hit with your little ones, but it’s far from a flash in the pan, offering stimulation and skill-building through a range of developmental stages. Reviewers have said this beautiful bus has become a firm favourite in their households, and its classic appeal and sturdy build mean it’s one to keep in the family. That it comes fully assembled is a bonus, too, and all of this comes together to award it our top spot. When they’re at prime “I wonder whether I should put this mystery object in my mouth” age, outdoor play can understandably be a bit of a nerve-shredder for parents, but with this wooden baby swing they can have the time of their lives while being safely corralled — and that’s what we call a win-win. Users love touches like the high-back seat, which attaches to the frame using secure carabiners, meaning it’s easily removable for stowing inside in bad weather, extending the life of the seat for more years of play. Toy masters the Early Learning Centre have done it again with this cute and colourful role play toy, activity centre and walker. Like the Kiddimoto London bus, it’s a beautifully made wooden toy that’s timeless enough to be kept for the grandkids (although we might be getting ahead of ourselves), but with the added bonus of offering not two, but three ways to play. As a push-along toy, it helps them find their feet in those early stages; as a toy kitchen, it expands their horizons with imaginative play; and as an activity centre, it teaches them those tricky but all-important shapes. Fab all round. This is definitely a blowout gift, so it might be best reserved for parents or grandparents rather than casual baby shower attendees — but boy is it impressive. The large, six sided wooden activity centre teaches everything you can possibly think of, from numbers to colours, letters to shapes, and does so beautifully. Every element is lovingly designed and made from solid wood, and there are a lot of them, so while it might seem like a hefty investment, reviewers agree that it’s worth it for variety, interest, and heirloom factor. Prepare for noise. Lots of noise. It might be a bit early to introduce them to AC/DC, but this orchestra set is as good a place as any to start them on a course to the Rock ‘n’ Roll Hall of Fame. Not only is it a great way to teach little ones cause and effect (you hit it and a cool noise comes out! Woo!) we’ve also yet to encounter a toddler who doesn’t love making a racket, and between bells, rattles, maracas, and a super cute ocean-themed bead-filled drum, there’s plenty of excitement to be had. Undoubtedly the best, though, is the xylophone, accurately tuned to real notes for baby’s first introduction to melody. For music-mad parents, we think this is a fantastic buy. Everyone loves Thomas and his steam-powered pals, so a Sodor-themed set is always a good idea if you’re not sure what to get the one-year-old in your life. This forty-piece set is a multi-sensory extravaganza of lights, sounds, songs and phrases, and it’s all up to them to discover as they push Percy around the track. They’ll not only get to exercise motor skills like reaching and grasping, but as they get a bit older, this set can teach them letters, numbers, colours and directions too. This starter train set is cute, it’s fun, and there are a shed-load of benefits your little one can gain from it, so for us, it’s first class. When it comes to buying gifts for babies and toddlers, the holy grail is something that’ll entertain them so much they won’t even realise they’re learning. This adorable pull-along plane toy is just that, featuring lights, music, sounds and shapes for endless hours of enjoyment. As they pull it along, the plane’s eyes move and it plays a cheery song, but if they haven’t quite mastered walking, there’s still great fun to be had, especially when it comes to the shape sorter, which rewards sorting with fun sounds. Reviewers have said it’s just as entertaining to watch tots interact as it is for them to play with it, and commend its quality and value. Looking for a cute but practical gift that they can use for years to come? A toddler-sized backpack is it, and they don’t come cuter and more practical than this Mickey Mouse version. This Disney backpack offers ample space for the essentials, and despite its instant recognisability, it’s certainly among the more understated options, so it won’t make you stick out like a sore thumb when it’s “your turn” to carry it. Plus, it’s got years of experience from adventure experts LittleLife packed into it, so expect quality materials and added extras like internal name and address tags and a slip-proof chest strap.